UberChopper and Avego Airlift: Helicopters avert Hamptons traffic, BART strike. The hot new ride of the summer for the Silicon Valley set. It used to be that when someone told you, “I’m taking the helicopter to the Hamptons for the holiday, old sport,” you could safely assume a few things about him: old, loaded, works in finance, ex-wife’s poodle’s name is Muffy—that sort of thing. Tap a single button to request a private driver who will transport you and four friends to the helipad, where you’ll take off directly for East Hampton. Another driver will be awaiting your arrival to drop you off at your final destination. Blair Waldorf, Don Draper, and Jay Gatsby got nothing on you. The $3,000 heli-charter service is a one-day stunt to promote the company’s new New York-to-East Egg SUV service, which launches this summer at $300 to $500 a ride. It’s aimed at that chronically under-served subset of young New Yorkers who consider themselves far too posh for the Jitney but can’t quite afford private helicopters of their own—yet. And it’s all brought to you by a company whose founder’s Twitter avatar is pulled from Ayn Rand’s The Fountainhead. Meanwhile, back in the Bay Area, a strike by public-transit workers has shut down BART and snarled the commute from the East Bay to San Francisco. 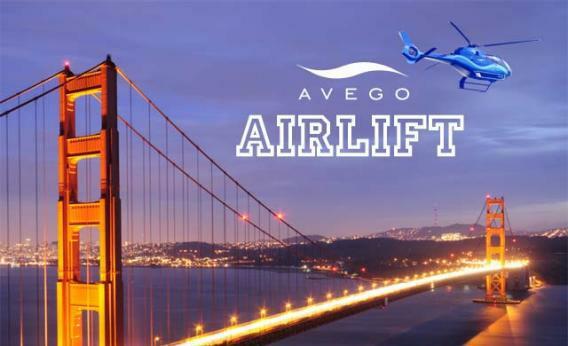 There, a ride-sharing startup called Avego is making only slightly less ostentatious use of helicopters, granting three customers per day a round-trip flight across the Bay. “Be an eagle, not a turkey,” the company urges in an ad for the Airlift service. “Rise above the BART strike chaos.” When I asked Avego whether “being an eagle” mightn’t be a little wasteful from an environmental perspective, a spokesman reminded me that the goal is to promote the company’s ride-sharing service, which takes cars off the road. No cognitive dissonance here! So there you have it. Private helicopters aren’t just for obnoxious old rich people anymore. Now they’re for obnoxious young rich people too.